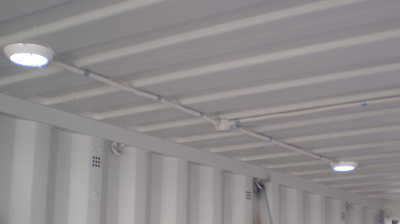 Solar lighting was installed in a modified sea container used as a bicycle shelter. The stand alone (off-grid) solar power was provided by 12v LED lighting powered by batteries that are charged by a solar panel. Solar power is provided by a 20 watt 12V solar panel generating about 4 Ah of battery charge in one day, based on an average of 4 hours of peak sunlight per day. 12V battery power is provided by a14.4 amp hour, 12 volt AGM sealed battery. Solar regulation (charge control) to the batteries is performed by a 6A 12V solar regulator. LED Lighting is provided by two 4.2 watt, 12 volt LED dome lights activated by a motion sensor. They each produce about 40 lux at a distance of one meter from the light and will use 1.3Ah of battery power per night if the lights are activated on 100 occasions. Wiring of components was done with 1.84mm2 twin core double insulated low voltage cable, suitable for the low currents flowing through the system and the short cable lengths produce very little voltage drop. All runs were laid inside protective 16mm electrical conduit. A 20 watt solar panel was not available at the time, so two 10 watt solar panels were bolted together by drilling two 6mm bolt holes though the adjoining sides and also a larger 10mm hole drilled to pass a cable from one panel’s junction box to the other in order to wire the panels in parallel (to double the current while maintaining the voltage at 12V). Care was taken to protect the back of the panels with a thin sheet of wood while drilling and fitting the bolts. Once mechanically and electrically joined it was effectively a 10 watt 12volt solar panel. 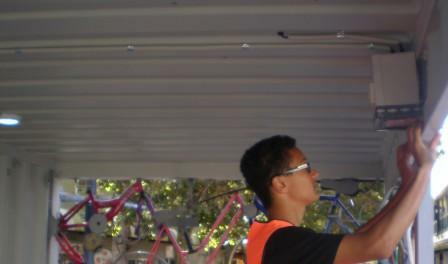 Brackets were then fabricated to tilt the solar panel as the roof is flat and it is best to tilt the solar panel toward the north ( in Australia) to allow better sun exposure. Tilting also helps to keep the panels clean as dirt and debris is more easily washed off by rain and swept off by wind. The two lights were wired together in parallel with the cables run inside flexible electrical conduit and joining at a central 3-way junction box then as a single cable to the power supply. Two 7.2 Amp hour, 12 volt sealed AGM batteries were connected in parallel to make up one 14.4 Ah battery. 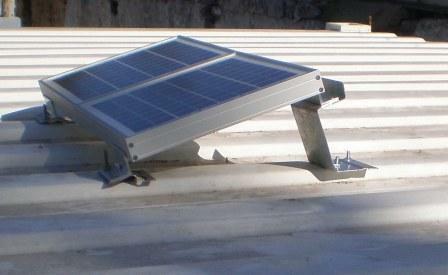 The batteries and solar regulator were placed in a 200mm by 200mm by 130mm PVC weatherproof electrical enclosure. The motion sensor was mounted in the lid of the enclosure by cutting out a rectangle to size and fixing it in position with PVC adhesive. Two 12mm holes were drilled in the top and cable glands fitted to allow entry of the lighting and solar panel cables. Additional mounting brackets were fabricated to hold the box more securely and also to cover the lid removal screws to prevent tampering. 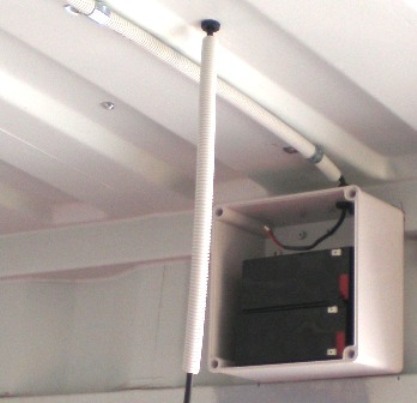 First the battery and solar regulator enclosure was installed in a position where the motion sensor, which is mounted in the lid, would be most effective. The box was fixed in position using the four corner mounting holes with the lid removed so as to allow access to the inside. connect wires from solar panel and lights. After that the solar panel was installed on the metal roof directly above the battery enclosure to keep cable lengths as short as possible. First a 12mm cable entry hole was drilled in the roof, then a 12 mm cable gland was inserted to seal the cable entry point and the cable was fed through to the battery box. Then the solar panel was fixed in position by drilling 6mm holes through the feet and the roof and secured with 6mm bolts and nuts (zinc coated for exterior use). Once the lights and solar panel were installed the electrical connections inside the enclosure were completed. The motion sensor, lights and solar regulator were first connected to the battery. Then the solar panel was connected up (it should always be connected last). The final step was to test the motion sensor and secure the enclosure with the fabricated brackets, screwed to the wall with self drilling screws.